Ed's put together a book charting his journey so far with long time collaborator and illustrator Phillip Butah. 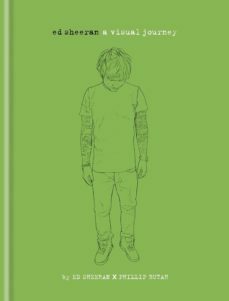 With words by Ed Sheeran and illustrations by his childhood friend, artist Phillip Butah (who produces artwork for Sheeran's albums and singles), and accompanying photos, Ed Sheeran: A Visual Journey is an exclusive, fully authorised, first-person account by Ed of how he became an internationally renowned singer-songwriter. In the book, Ed explores his early musical experiences and influences as well as his time recording and touring, right up to the release of his second album, 'x'. The book reveals what drives and inspires Ed as he continues to evolve as an artist, while coping with stratospheric success, and is an honest account of what it takes to make it in the music business. With Phillip Butah's distinctive portraits of Ed throughout, this is a unique book celebrating a unique musician. It includes Ed's recollections of working tirelessly on the London gig circuit and self-releasing EPs, working hard on finding his sound, signing to Asylum Records and recording his huge hit album, '+', performing at the Grammys, touring with Taylor Swift and sell-out headline gigs at Madison Square Garden. It takes us up to Ed as a musician today, including recording his new album, 'x'.